Now, I understood what he was saying. Nothing, not the food we eat, soil I grow it in, house we live in, or the everyday comforts of my life would be possible if he did not pay the bills. Someone, somewhere, needs to pay the bills. That fact does not elude me. However, one of the reasons I wrote my book was in defense of a lifestyle that “did not pay its way.” Which is why I was taken aback. 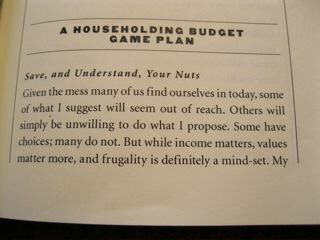 Did he not read my chapter on Budgets? While I have never ignored the serious conversations about social and financial inequities associated to class, race, and gender, I also believe our value and worth is deeply entrenched in a economic language that has all but captured our lives and imagination. But that is part of my fancy talk; the ideological and linguistic carbon dating of a system that is, in my opinion, doing us and the planet a world of hurt. Yet the fact remains that most folks do not live in fancy-talk land, which is what I think he was trying to say. I understood his point, at least in theory. But I also assumed we were a “what’s yours is mine” sort of team working together towards the same end, which brings me to the point of today’s householding rant: What happens when and if your partner(s) (be they housemates or married mates) decides their end of the economic formula — I’ll work “out there” you’ll work “in here” — isn’t working for them? What happens if you don’t have a lot of nuts squirreled away somewhere when the bloom is off the heirloom rose? It would be lovely (and a tad idealistic) to suggest that everyone who takes on this life will have a partner who understands the value of this work. To be fair, I don’t think I ever asked my husband if he was really on board. A good part (huge actually) of his perception of our lives together involved dual incomes and a fat nest egg for our retirement and for sending the kid off to college. 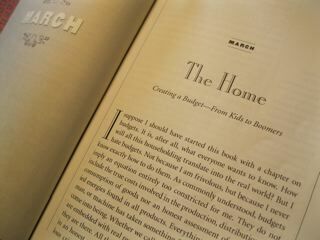 [%image reference-image float=right width=400 caption="The Home chapter from Harriet's soon-to-be-released book. "]Though it was not really in my game plan to give up work “out there,” I did. After years in the grind I was sick of it all and thought repairing the planet (given its health and all), seemed awfully reasonable. The problem is, I never really sat down and talked to him about it. Oh, in a vague way  — but I’ll admit, I didn’t imagine he would have a problem with it. I guess he knew, on an intellectual level, that what I was doing made sense. But on an emotional level he was not really on board. Which is why I think frank discussions about who we are and why we want to return to this life is so very important. One of the reasons this householding life can be such a hard sell, as it were, is because there has been a slow and constant disregard for the skills involved in doing it well, and that is a big mistake. Frankly, I’ve worked on some pretty complicated projects in my life but almost none of them as challenging as householding. Doing a job well is not the province of the career-bound. Figuring out all that is involved with householding takes work. It takes smarts, a good work ethic, and a commitment to a fair amount of tedium (which suggests the need for a fair amount of maturity). Yet ever since industry has lured us from rural lands to urban blacktop, from our homes to the office; convinced us that education must come from academia, and given us a boatload of labor-saving widgets and foods to enjoy our in leisure and/or to manage the stress of an ever-increasing work day and ever decreasing pay scale (compliments of our famous global economy), we have forgotten what it really takes to make this householding stuff work. But make no mistake, this work is as hard and honorable as any other, and anyone who says otherwise simply has not tried it. Dismissive attitudes aside, even the most committed go-go growth advocate out there is beginning to understand the broken promise of industry and our global economy (going to bed with China will be our undoing). Slowly we/they are beginning to understand that growth projections cannot be sustained, that a “correction” is coming, and that we better start thinking about a new way of measuring our production and worth as a nation. I suppose I should be thrilled about those conversations about the new GDP (Gross Domestic Product) and how we need to re-calculate our notion of production. Pundits, politicians and economists alike are beginning to consider the value that comes from community volunteerism, raising our children, growing food and cooking meals to support the health and well-being of our families and neighbors. Not that we householders really needed them to tell us any of that but it is step in the right direction, particular if we want to restore the dignity of our efforts. Frankly, it is not just my husband who has a problem with what I do at times but many others who consider it anything from elitist to a sure-fire trap for gender subjugation. I understand the concern, but facing off with concerns is the opportunity, not running from them. I welcome the naysayers if only in an effort to flesh out the debate (I guess Shannon Hayes has taken a fair amount of grief for her book Radical Homemaker from those who might prefer we all get out and work for industry). [%image budget float=right width=400 caption="Budgeting, in the book. "]But where I say we need to stay firm in our convictions I also say we need to get real. Which brings me back to the real conversations we need to have about “paying our way” in the event your partner decides your efforts do not cut the homemade mustard in the world of empire. Fancy talk aside, I did offer some concrete ideas towards affording this life, and I believe they are doable — not just for me but for the kids that will be inheriting this planet (fact is, this book is a love song to them). But what I did not offer is the template for a legal contract that might need to go with this budget. Frankly, I’m not exactly sure what it would look like, but it does seem to make sense to consider one. For now I suggest you sit down and discuss your vision with your partner. Decide how much time your family and housemates want to dedicate to this life. Discuss what you value and why, and then get it down on paper. Tuck it away with all your other important documents and, when and if the time arises, take it out to review it. Doing so might help to dissipate the perils of (a) fancy talk and/or clumsy talk or (b) being left out in the cold. I close with another quote: “None of it — not the meal, not the family, not even the roof over our heads would be there if we did not care for the soil. It was from the soil, the healthy fertile soil, that the foods and opportunities sprang forth for those who came to this land such a long time ago.”  What opportunity shall we leave for our children? Who shall pay their way?